This article is about the 2012 videogame. For other uses, see The Walking Dead (disambiguation). The Walking Dead is a funny title. On one hand, I didn’t expect much. It was created by little known episodic game developer Telltale and is based on a flavor of the month property with quick time event-y gameplay. At the same time, the game has a cool art style, is focused more on dialog than action, and has a good story and excellent voice-acting. So where do all these dominoes fall? Let’s start with the most significant effort put into this game. 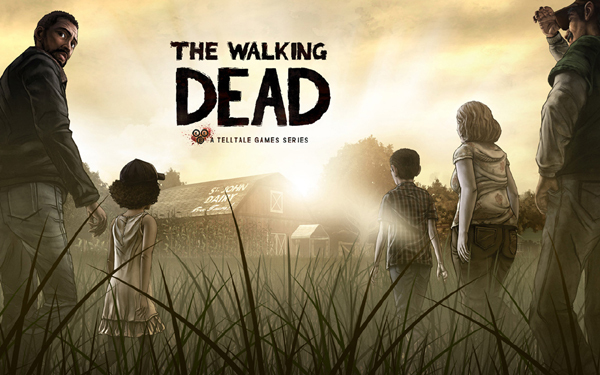 The Walking Dead emulates a tv show and pulls off its 5 individual episodes nicely. The story is well-paced and contains a bunch of characters, all with their individual quirks and annoyances. The emotional beats are well complemented with driving, sad music, and the world feels believable and tragic because of it. These qualities alone make the game a success, and all the awards and financial gains are, I believe, well deserved. Doing something fresh in this industry is a big deal, and even Valve couldn’t pull off the episodic thing. However, there is a decent counter-point to all these praises. The story, while well scripted and much better than most videogames, is basically just a rehash of The Road. A grown man watches over a little kid in a post apocalyptic world, they run into bandits, they run into cannibals, and as sick as the man gets his entire goal is to protect the one innocent thing around him. There are more parallels but you get the idea. If this was a movie it would receive the same criticism more publically, but in general people are plenty happy with the mature subject matter because ‘this is just a videogame.’ So while I don’t think The Walking Dead is setting back games as a medium, it is still just playing catch-up to cinema instead of doing something truly unique. There are other small problems, and since it’s easier to fill a page with negativity than praise, I’ll take a couple more paragraphs to explain. The characters aren’t quite as consistent as I would like. The ‘best friend’ is heroic at first, then turns cowardly and useless, then turns heroic again. The conversations are often disjointed and there were times when a reference to a previous event was said in a generic fashion as if to avoid the trouble of recording separate lines to reflect what specifically happened. And while it should be obvious that this is a game for those interested mainly in story, the gameplay and controls of some sections are certainly lacking. This is not a deal-breaker and is to some extent excusable for this type of game, but Telltale could’ve done a better job. But with all the nitpicks about The Walking Dead, the ultimate criticism must come down to the meaning of choice. In a tight narrative, story branches are a big problem. Often the illusion of choice is better than actual game changing events. But if the player sees behind the curtain- if it is obvious that pressing X or A or B all end with the same result- then the idea of interactive fictions breaks down. Early portions of the game had moments where one character or another could die but the end game still played out the same. I would’ve hoped that, with all the reminders about how the game "adapts to my choices", that I could’ve created more diversity with my inputs. All of that said, in the end The Walking Dead is a great thing for this industry. It’s a surprise hit that feels very different even from other quick-time games like Heavy Rain. It is supposed to give you the experience of ‘playing a tv show’ and the amount of time and thought commitment nail it. There’s some dark humor, there’s some tragedy, and there’s a whole lot of entertainment.